Where did I get it? I bought it as an eBook on pre-order and it was handily delivered to my tablet on release in October. I saved it to read around Christmas and I'm glad I did. What's it about? 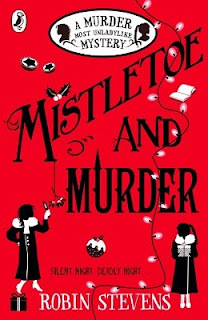 It's the fifth book in the Murder Most Unladylike series which star Daisy Wells and Hazel Wong as detectives. I've read them all except for the fourth one, which I've got and meant to read before this, but Christmas arrived and I decided to jump this one ahead in the queue. I'm so glad I did. I loved it! Hazel and Daisy are spending their Christmas in Cambridge with Daisy's brother Bertie, who's in his first year there at the fictional Maudlin College. Hazel and Daisy are staying with Daisy's great aunt at St Lucy's, a fictional women's college in 1935 (when women could study with the men but couldn't actually gain degrees), but keep popping across to Maudlin. Bertie lives there with the Melling twins, Donald and Chummy, and Alfred Cheng, a Chinese student, and a couple of others. Daisy and Hazel's friends Alexander and George are staying with George's brother over in St John's college. Bertie and his friends are into "climbing" which involves scaling the university buildings with no equipment or ropes. Donald and Chummy are about to turn 21 and inherit all their family money, but it seems like someone is trying to kill Donald - is it Chummy, to get the money? Reading these books from an adult point of view is somewhat frustrating, but if you put yourself into the mindset of a thirteen year old Hazel, they are utterly enchanting. This one especially, because it's all pretty colleges and snow and roaring fires. I love these books and I'm already looking forward to the next one. What age range is it for? 10+. I think any kid who likes Sherlock Holmes would love these. Would I recommend the book? Yes absolutely. What a lovely festive book to read. How many stars? Ten out of ten - no book is perfect but this one made me feel so lovely that it gains full marks.